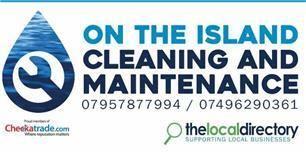 On The Island Cleaning and Maintenance - Cleaning Services, Driveways/Patios/Paths, Fencing/Gates based in Binstead, Isle of Wight. We are an island based company, we provide a wide range of Cleaning and Maintenance Services. With our extensive experience we deliver outstanding results at competitive rates. We pride ourselves in offering a prompt, efficient service and are always conscious of our customers’ needs. Why not have a look at some of our work by visiting our Gallery.